St. Patrick’s Day is coming up and I’m not Irish, but I love Irish Soda Bread. I can’t claim to do much pub crawling, but I did just post about potatoes. I never got into Lucky Charms, but through some twisted and fortunate miscalculation of the leprechauns, I got the luck of the Irish. Yup, I’m the luckiest gal around. I’ve got the most supportive husband, the smartest dog (she does at least 30 tricks), the most non-overbearing mom, and another reservation for Brooklyn Fare. This St. Patty’s Day, I’m going to spread my luck around with four leaf clovers, a traditional symbol of luck. 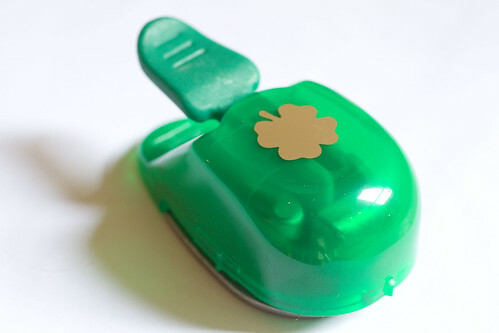 I picked up a four leaf clover punch at Paper Presentation 23 West 18th Street, New York, NY 10011 (I’m pretty sure they’re available at most craft stores.) and punched out basil clovers. I chose basil because it’s relatively flat and has a wide enough leaf to punch shapes out of, but you can try other flat leaf greens. Admittedly, this was a little more time consuming then I thought it would be, mostly because the leaves are not perfectly flat so they need a little coercing to get in and out of the puncher. It’s really easy though and is such a low cost way to holiday-up your dish. It’s also subtle and elegant, not all covered in green-food coloring. Once you’ve punched out your clovers, they can be tossed onto anything you would put basil on (assuming you are using basil). 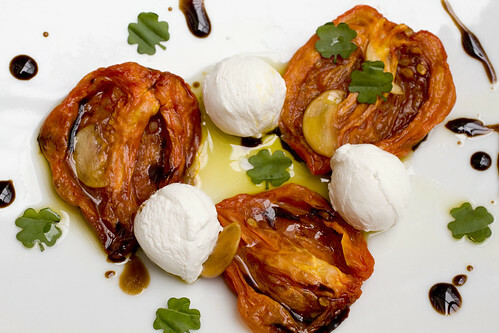 I used them to garnish a plate of slow roasted tomatoes and bocconcini. Yum! posted by jessica	at 02:21 PM	Filed under Holidays, Irish, Recipes. You can follow any responses to this entry through the RSS 2.0 feed. Both comments and pings are currently closed. 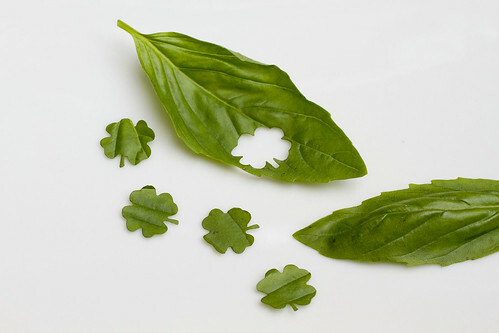 The four leaf clover basil shapes are so neat! what a brilliant idea! so cute! That is one of the cutest ideas I have ever seen! Thanks everyone! Flattery works every time! BRILLIANT! I absolutely adore this idea and will definitely be doing this. Thanks! Those are adorable! Your multi-colored potatoes had me drooling too. Oh I love it! That’s more than lucky that’s brilliant! 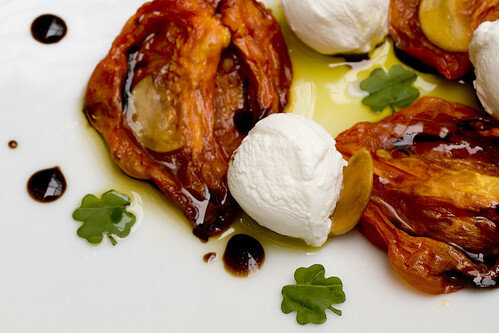 Gorgeous salad and what a great touch the clover basil! Such a great idea! Definitely a step up from loads of green food coloring. wah great idea! Gorgeous presentation. Very cute but culturally inaccurate. The traditional symbol of St. Patrick’s day is the shamrock, which has three leaves. He used it to signify the holy trinity. Hi John, thanks for the clarification. This is genius. I might have to put little green leaf stamps on everything I eat on the 17th!